Quercus Silver: Round and Round we go. I was making a pair of spiral cufflinks this week and thinking how tricky such a simple shape is to get right . Looking them up for a mathematical clue , I discovered there are so many different types, from your neat Archimedean to my favourite "spira mirabilis" or miraculous spirals, named by Bernoulli for their mathematical beauty. A feature lost on me, but they look like ammonites, which I love and are numerous around here. Here's one we found on the beach at Lyme Regis recently, It's a meter (3 feet) across! They're such a fundamental part of part of nature and mathematics and their appeal is as ancient as the sun. It's no surprise, then, that jewellers return to this motif nor that it's so popular. I certainly can't resist . 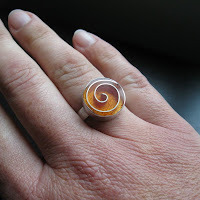 The orange ring pictured here was one of my first resin pieces, the cufflinks my most recent. So, I'm still practicing . I read your post before I went to work, and then at work found myself cutting spirals out of paper for a craft thingy I did with the children. The power of the blog. were they those dangly snake like spirals? I love making those.